On Wednesday 21st October 4 Maple had their turn in the garden. Luckily, the weather was nice and it had stopped raining. Firstly, the children were taken on a guided tour of the garden by Dave. He explained what everything was and how the school was trying to grow its own fruit. Everybody learnt something new, even Mr Haycock! Secondly, the children went in the poly tunnel to look at the plants, seeds and other things that were being housed in there for the winter months. The children looked at sunflower seeds and tomatoes. Finally, everybody got their hands dirty by digging for potatoes. Then, they had to pick up great big piles of leaves to make compost, before they unearthed plants (trying to keep the root attached). Thank you to Dave for a fantastic afternoon of learning! On Monday 19th October the Chilcote boys' football team played against Severne Road school. The game took place at Yardley Wood playing fields. This was their third league game. Severne started the match as the better team and had a couple of chances. Chilcote then got a free kick and Damian managed to put it into the top corner. Not long after, Severne equalized with a powerful long range effort. Not long before half time Severne then took the lead after some poor marking from Chilcote. In the second half Chilcote performed much better and tried to get an equalizer. They were quite fortunate when it came as it took a big deflection. Chilcote spurned all of their chances in the second half. They got a point in the end with another 2v2 draw. Well done to all of the boys with a little more luck we may have got the win. On Friday 16th October the Chilcote boys' football team played against Colmore in their second league game of the season. The game was played at Yardley Wood playing Fields. The game started at a fast pace and continued like this throughout. Chilcote took an early lead when Cian crossed the ball in after a lovely team move and Sam put it into the bottom corner. Not long before half time Colmore managed to get an equalizer with a similar well worked team goal. After half time Colmore pressed to take the lead and had a number of long range efforts. Chilcote broke though, and scored their second. Cian again got the assist and found Damiam to head home from close range. Unfortunately Chilcote just couldn't hold onto the lead and Colmore equalised from a corner. The gaem ended 2v2. As Mr Cross said at the end this game was a fantastic advert for school football and both teams deserve a lot of credit for the way they played. Well done to all involved!!! A huge thank you to everyone who came along and supported our coffee morning on Friday. It was lovely to see so many parents and friends of the school all coming together for such a great cause. We have now counted up and we are thrilled to announce that we have raised a fantastic £603.22 for Macmillan. What a great way to round off our Out and About week. Many thanks for your continued support!! Year 6 Out and About Week! Across Year 6, we have been taking part in various activities for Out And About Week. In Maths lessons, we have gone outside and made up word problems using nature; we have also used the playground learning resources to find out about factors and multiples. In English, we went outside to get inspiration for a descriptive story opening. We used what we could hear, smell, touch and see to help us to write ambitiously. Furthermore, we have been helping with community projects such as advertising the Macmillan cancer charity coffee and cake morning (we designed information posters and spread them across the school!). Also, The House and Vice Captains organised and ran the actual event, which was very successful! Last but not least, all of Year 6 have been working extremely hard on our Harvest Production, which will help to raise awareness for families in need and teach us all about the morality of greed! Everyone will have the opportunity to see the finished production in the last week of half term! We have had a great time in Reception this week! We've been doing lots of activities to celebrate Outdoor Week and our local community. On Monday we talked about how to keep our school grounds looking lovely. We said that we always needed to throw any litter in the bins so that our school stays neat and tidy. On Wednesday we had lots of fun exploring our local area. We went for a walk, to Baldwins Lane, to see all of the lovely houses that were there. We also talked about the shops that were on Baldwins Lane and what we could get from each one. Today we went to a special coffee and cake morning to help raise some money for for the charity Macmillan. 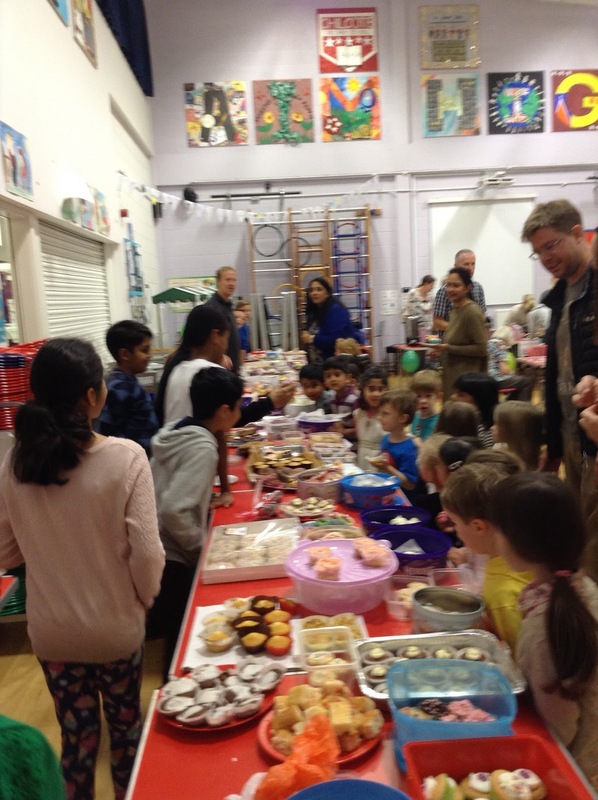 We sang for all of the parents that were here to join us and we did a great job of bringing in, and buying, lots of yummy cakes. They were delicious!! As part of ‘Out and About Week’ year 4 have been doing lots of different activities. 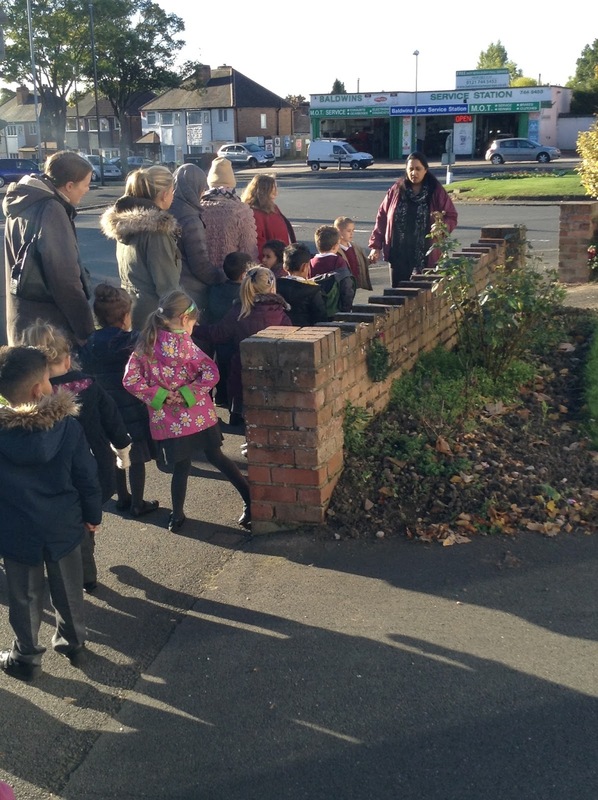 Firstly, we went to Chinnbrook playground so that we could evaluate it, and make suggestions about how to improve it. After that, we designed our own playground which included lots of the improvements. Secondly, 4 Lime went to the garden and learnt about all of the plants growing there. They also learnt about how to look after the different plants. Thirdly, in English we read a story called ‘Ruby Nettleship and the Ice Lolly Adventure’ in the story area. This was about a girl who played at a playground that needed to be made better. Also, we wrote a letter to the Mayor asking them to improve Chinnbrook playground. Fourthly, in Maths we played games in the outdoor area. We played human battleships (to help with our coordinates) and giant snakes and ladders (to help with our counting). Next, we went on a litter pick to help keep the local community tidy. We picked up the litter on Scribers Lane. Finally, visited the Macmillan coffee morning and ate lots of cakes. Also, we decorated our harvest box ready for it to be given away. We have all really enjoyed ‘Out and About Week’ and learning outdoors!!! It was Anti-Bullying Day on Friday 9th October, and we had a great time! We watched a phenomenal theatre production called the B Word: it was all about how to cope with bullying and how to support the child that is being bullied. Also it told us that we must tell our parents and teachers if we are being bullied or we witness it ourselves. In Year 6 we also completed acrostic poems and answered some important questions about how to support others in different bullying dilemmas and scenarios. Furthermore in Chestnut and Sycamore we made posters and comic strips about bullying using the Comic Life App on the iPads. Hopefully you will see some of our fantastic work on the Anti-Bullying wall display within school. It was a great day once again and we learnt loads about Anti-Bullying that will help us in our lives. On Friday the 9th October the Chilcote football team played against Yardley Wood school at Yardley Wood playing fields. This was the first game of the league season. Chilcote started well and Tom scored directly from a corner! Then, Damian scored to make it 2v0. He then added a third, before Sam scored a fourth. The score was 4v0 at half-time to Chilcote. In the second half the game totally changed. Yardley Wood scored after a defensive mix up. They then scored again. Chilcote then had a couple of chances to put the game to bed, but didn't take them. Yardley Wood then scored again, but Chilcote managed to hold on to win the game 4v3. A great result to start the campaign! Well done to all involved! Today we had lots of activities to do around the theme of anti-bullying. Firstly, we looked at what bullying was and what we could do to stand up to bullies. We also discussed what we could all do to stop bullying. Secondly, we had a choice between an anti-bullying poster, an anti-bullying poem or we were to use the i-pads (Explain Everything app) to explain what bullying was and how we could stop it. Thirdly, we created a class wordle about anti-bullying. We all provided one word or phrase for the wordle. Next, we watched a theatre production about anti-bullying. It was excellent and really showed us how bullying can impact on the lives of the victims. After that, we read 'The Swan and the Pike' and discussed the moral message of the story. We then performed a role-play of the story to show the moral message. Sixth, we went down to Reception and showed them all of the things we had done during anti-bullying day. They then showed us some of their fantastic work. Finally, we played the anti-bullying edition of Who Wants to be a Millionaire. We won lots of money!!! A busy week in Nursery! Wow, what a busy week we have had. The children have been busy in the classroom, making friends (and mess!). We have also had our first ICT lesson and PE lesson, and the children did well. Today has been our Anti Bullying day, where we discussed the story The 3 Little Pigs, thinking about what a bully is and how they can hurt our feelings. We were also lucky enough to have Year 3 visit us and they told us all about the work they have done on Anti Bullying. The children loved having the older children in to see us all. Also this week, we had our first Superstars assembly on Tuesday afternoon with Mrs Doherty. 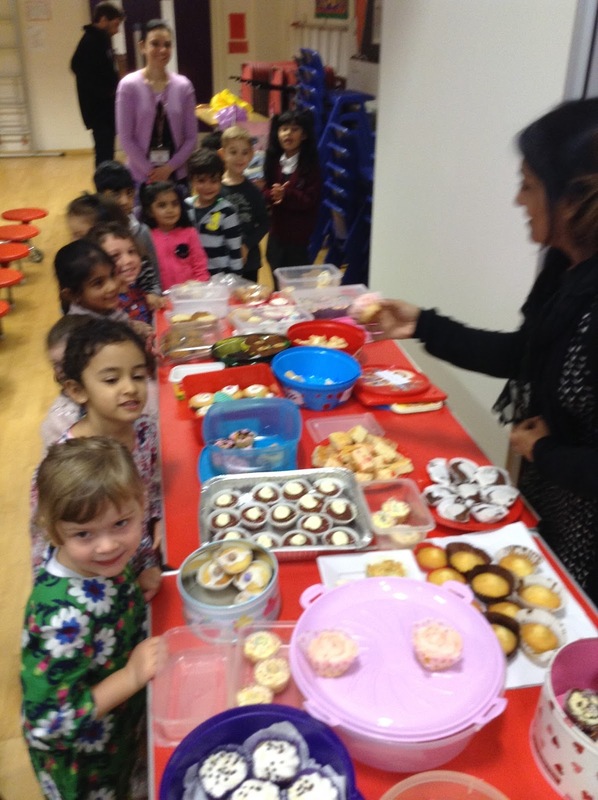 She celebrated all of the wonderful things we have done so far in Nursery and the children sat and listened well. Salahuddin Jabbar, Scarlett Black, Alex Kundola and Autumn Wright-Taylor. We had lots of fun today in Reception during anti- bullying day; we learned an important lesson about what bullying is and how to help those who are being bullied. We explored the story of The Three Billy Goats Gruff; we could not believe how mean the troll was and thought he was a bit of a bully! We did lots of activities and art work based on our story and had a great time! Year 4 came to visit and we shared with each other what we had done. On Friday, Year 6 went on a phenomenal trip to London. The coach journey was long and restless, but we knew that it would be worth it in the end! When we arrived at around 10:00am, we left our transport and went to explore the Science Museum, it was amazing! First we watched a very intriguing show all about different structures, such as man made buildings (e.g. bridges) and natural structures too (e.g. mountains). One child had to sit on a chair of nails and Mr Canning got turned into a sandwich and bashed with a mallet (all in the aid of science learning though). Furthermore we participated in different experiments such as: how much force four eggs can hold before smashing (it's more than you think because the force gets spread across the arched surface area of the egg!). After that we went into Launchpad (a science experiment centre where we could try out different experiments for ourselves). It was a mind blowing time as we saw disappearing sand, illusions and mirror tricks - it was an experience we will never forget. Following a quick lunch we went to see Buckingham Palace where we saw the soldier guards and police officers armed with dangerous weapons (guns and swords) circling the perimeter checking for anyone trying to sneak into the flamboyant, opulent palace! Mr Cross gave us some very interesting information about the Palace - such as if the union flag is flying then the Queen is actually not home. Next we saw St. James Palace, St James Park, Horse Guards, Downing Street, the Palace of Westminster and the London Eye! The best bit was waiting to watch the guards change at 4:00pm, as Mr Cross got shouted at by one of the guards walking past him (he was very quiet after that!). On Thursday 1st October seven children from year 3 represented the school in a mixed football tournament. The tournament was held at the Baverstock Academy. The children played against two other schools in a round-robin league (they played each other twice). They did really well in their matches. They won the first 3v1, then the second 2v0, then they drew the third 3v3 and scored a last gasp equaliser, finally they lost their last game 1v0. This meant that Chilcote finished in 1st place and won their second tournament of the year! Well done to all of the children who represented the school brilliantly! The new year means more Baverstock sports tournaments at Chilcote. Last year Chilcote finished as the overall best school in the Baverstock partnership, so we want to be the same again this year!!! On Monday 28th September a mixed year 4 football team represented the school in the first Baverstock tournament of the year. The tournament took place at the Baverstock Academy. The children played five other schools in the tournament, which was played in a round-robin format. The children did really well and scored lots of goals without conceding too many. This meant that Chilcote finished in 1st place and won the tournament! Well done to all of the children who represented the school! On Friday 25th September the Chilcote Boys' football team played a tournament at Maypole F.C. The boys played against three other schools in their group. They drew their first game 0v0, won their second game 4v0 and then drew their last game 1v1 conceding a goal in the last 30 seconds of the match. This meant that they finished second in the group. Unfortunately, this meant that the boys finished 5th overall out of eleven schools. This was a good start to the season though so well done boys!!! On Friday 18th September the Chilcote girls' football team played a football tournament at Maypole F.C. They played a total of five matches. They won two and drew three. They only conceded 1 goal in the entire tournament. This meant that the girls finished in 2nd place in the tournament. Well done to all involved!